Coach Pete Carroll said Dissly (knee) may not be ready for the start of OTAs this spring, Bob Condotta of The Seattle Times reports. Analysis: Dissly has been out of commission since Week 4 of last season when he damaged the patella tendon in his right leg. He'll be roughly 10 months removed from the injury by the time training camp opens this summer, which should be enough time for him to get back into shape. Dissly (kneecap) was placed on injured reserve Tuesday, Bob Condotta of The Seattle Times reports. Analysis: Dissly will miss the remainder of the 2018 season due to a patella tendon injury. 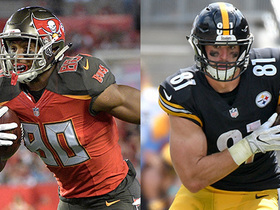 The rookie will turn his focus toward recovery and will work toward potentially retaking the field Week 1 of next season. Heading into Sunday's game against the Rams, expect Nick Vannett to serve as Seattle's No. 1 tight end option. Coach Pete Carroll said Dissly (knee) will undergo surgery this week and be sidelined for the rest of the season, Michael-Shawn Dugar of The Athletic reports. Dissly (knee) has been diagnosed with a patella tendon injury, Bob Condotta of The Seattle Times reports. Dissly won't return to Sunday's game in Arizona due to a knee injury, Michael-Shawn Dugar of The Athletic reports. Analysis: Midway through the first quarter, Dissly required a cart to get to the locker room after injuring his right knee. He'll undergo the requisite tests to hone in on a diagnosis, at which point an absence, if any, will be known. Nick Vannett is left as the sole healthy tight end on the Seahawks' 53-man roster. Dissly caught just one of three targets for four yards in Sunday's 24-13 win over the Cowboys. Analysis: Dissly had been one of the biggest fantasy surprises of 2018, with six receptions for 147 yards and two touchdowns through the first two weeks. He was hardly involved Sunday, although Russell Wilson didn't air it out much, attempting just 26 passes. As long as Doug Baldwin (knee) remains out of the lineup, there will be opportunities for other pass catchers to be more involved, but Dissly might have already peaked. If you're using Dissly in Week 4, he'll face the Cardinals on the road. Dissly caught three of five targets for 42 yards and a touchdown in Monday night's 24-17 loss to the Bears. Analysis: Dissly had a team-long reception of 34 yards, flashing big-play ability for the second straight week to start his career. Furthermore, like his NFL debut, the rookie fourth-rounder again found the end zone Monday. 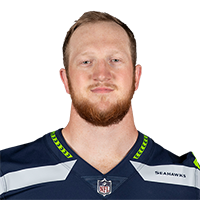 Although that came via a two-yard catch with 14 seconds left and the game's result already decided, Dissly's impact has been felt nonetheless. The local Washington product is one to continue to keep an eye on, particularly while Doug Baldwin's (knee) status remains murky. 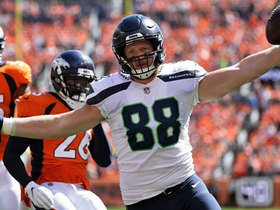 Dissly is listed as the Seahawks' first-team tight end on the team's unofficial depth chart for its Week 2 game against the Bears, Michael-Shawn Dugar of The Athletic reports. Dissly hauled in three passes for a team-high 105 yards and one touchdown on five targets during Sunday's 27-24 loss to the Broncos. Dissly hauled in both of his targets for 19 yards in Thursday's 19-17 preseason loss to the Colts. Analysis: Dissly also showed glimpses of exceptional run blocking, which is why the Seahawks drafted him in the fourth round. 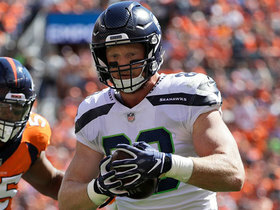 He likely won't be a fantasy contributor this season as the third-string tight end, but Dissly could form into a vital edge-sealer for an untapped backfield. Seattle Seahawks tight end Will Dissly helps Seattle Seahawks quarterback Russell Wilson with an open window in the end zone to score the second and final touchdown of the game against the Chicago Bears for week 2. 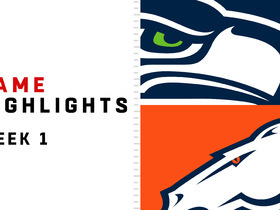 Watch the best plays and the top highlights from the Seattle Seahawks-Denver Broncos matchup in Week 1 of the 2018 season. Seattle Seahawks quarterback Russell Wilson finds tight end Will Dissly who bursts downfield on a 66-yard completion. Seattle Seahwaks quarterback Russell Wilson floats a pass to tight end WIll Dissly for a 15-yard touchdown.